Join us for the premeire of the show... red carpet and all! Best part? It's all free of charge!!! Simchas Torah is the MOST JOYOUS holiday in the Jewish calendar. There's no better place to be then at CHABAD! 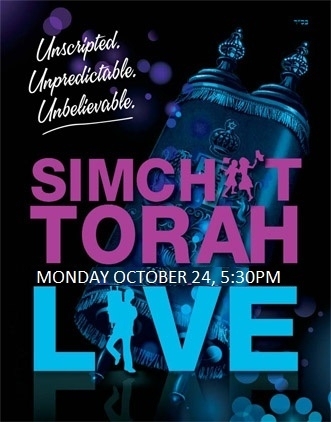 Join us for an evening of singing, dancing and delicious dinner celebrating Simchat Torah. Join us for a special presentation of the "Hakafot dancing"
• ADMISSION: FREE OF CHARGE! FOR MORE INFO AND TO RESERVE PLEASE CALL 508-473-1299 OR E-MAIL: info@GotChabad.com. View the complete holiday schedule here.